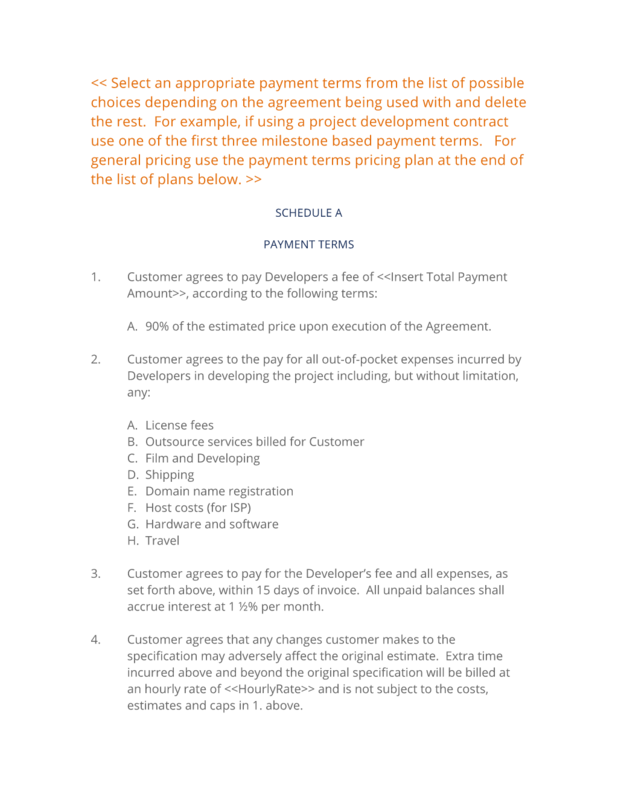 The Payment Terms document is an attachment to the contract. This is what the client is agreeing to pay for the project. The interview materials and estimate spreadsheets in previous sections are used to determine the cost. The Payment Terms are broken into 3 different payment plans to choose from. Pick which one works best for you and your client (full payment up front, half down, 1/3 down, etc.). These payment terms are for illustration purposes only. If you have your own standard payment terms you may substitute them here. This Schedule A (Payment Terms) (Can/UK/Aus) is included in editable Word format that can be customized in Word or by using the included Wizard software. Select an appropriate payment terms from the list of possible choices depending on the agreement being used with and delete the rest. For example, if using a project development contract use one of the first three milestone based payment terms. For general pricing use the payment terms pricing plan at the end of the list of plans below. 90% of the estimated price upon execution of the Agreement. Outsource services billed for Customer. Customer agrees to pay for the Developer's fee and all expenses, as set forth above, within 15 days of invoice. All unpaid balances shall accrue interest at 1 1/2% per month. Customer agrees that any changes customer makes to the specification may adversely affect the original estimate. Extra time incurred above and beyond the original specification will be billed at an hourly rate of Hourly Rate and is not subject to the costs, estimates and caps in 1. above. Customer agrees that estimated yearly maintenance costs are only estimates and are not included in the quoted price. 1/3 of the fee upon execution of the Agreement;. 1/3 of the fee upon completion of Insert Key Payment Milestone. The remaining 1/3 upon completion of the specification. Customer agrees to pay for the Developers' fee and all expenses, as set forth above, within 15 days of invoice. All unpaid balances shall accrue interest at 1 1/2% per month. Customer agrees that any changes customer makes to the specification may adversely affect the original estimate. Extra time incurred above and beyond the original specification will be billed at an hourly rate of Hourly Rate and is not subject to the costs, estimates and caps in 1. above. Customer agrees that estimated yearly maintenance costs are only estimates and are not included in the quoted price. 10% of the estimate upon execution of the Agreement of Total Payment Amount. Customer is billed at Hourly Rate per hour at the completion of each milestone. The customer will not be liable for more than Maximum Billing Amount in hourly work. Customer agrees to pay for the Developers' fee and all expenses, as set forth above, within 15 days of invoice. All unpaid balances shall accrue interest at 1 1/2% per month. Customer agrees that any changes customer makes to the specification may adversely affect the original estimate. Authorization for credit card payments for development per Schedule A and B. Charges to be applied as Customer accepts each milestone. Customer accepts liability for all costs incurred (including but not limited to chargebacks and reversals). The complete Schedule A (Payment Terms) (Can/UK/Aus) - with the actual formatting and layout - is available in this Contract Pack.